Loose CZ’s and settings help us think outside the jewelry box. When it comes to picking out an engagement ring, there are a million choices both online and in the jewelry stores around your town. Many couples start with a budget and then go from there. After the price point has been decided, bridal rings are chosen based on a particular favorite setting material and design. The problem comes when the bride-to-be can’t find a thing she likes within the constraints of the budget. Do you want a particular style of ring that you can’t find anywhere? If you have your heart set on something that represents the unique relationship you have with your mate, custom designing your own engagement ring is a wonderful idea. It can also save you a lot of money. A sterling silver scroll setting with a pink heart-shaped 2 carat CZ. A yellow gold setting with a round blue CZ center stone. 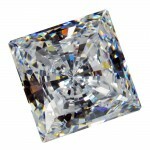 A modern stainless steel setting with a princess cut CZ . 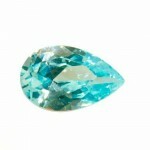 What about a pear-shaped Aquamarine CZ on something intricate and vintage? From left to right: 0.10 Ct Diamond Weight Square cut, 0.50 carat Diamond weight Emerald cut CZ, 1.65 carat Diamond weight round cut CZ. Aren’t these stones gorgeous? The real shocker are the prices. At the time of this post, not one of them cost more than $15.00 each. All of the stones are sold through Amazon by the Logos Company. 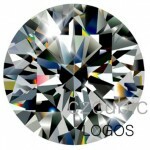 They offer some incredibly affordable loose Cubic Zirconia gemstones that are believably brilliant. Their 12 carat stone is a knock out! 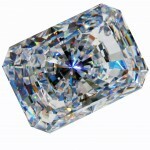 What I love is that you can buy a good-quality loose CZ for under $5.oo (!). I know that sounds cheap, but when you have a diamond weight Cubic Zirconia made by a reputable company mounted on a great setting, you really can create a fabulous engagement ring. Engagement Ring Settings– Reputable jewelry companies like Zales, Kay Jewelers, Littmans, e.t.c. always offer settings so the bridal couple can make their own design if they choose. Some come with genuine diamonds along the band. Gemstone Settings– If you compare the prices between a gemstone setting versus an engagement ring setting, the gemstone version is much less expensive. You can really see the price differences if you check out Zales Engagement Ring Settings versus Gemstone Settings by JTV.com. I think shopping for a custom ring would require some extra planning, don’t you think? So many setting and stone choices! What would you put in here? Choosing a loose gemstone that reflects your favorite color and shape ( and dream carat weight) is a lot of fun. With a fake diamond, you can get more for your money. Once you have your stone or stones, you can head off to the jewelry store to leaf through the setting book. 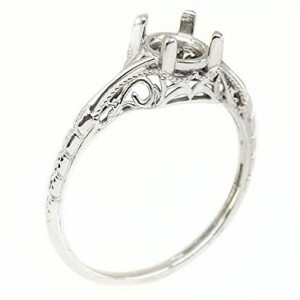 They will advise you what type of prong setting works best with the stone shape and size. They will give you a date of completion and have you come back for your final fitting/ inspection. Many, if not most, jewelry stores let you place items on layaway. You will receive some type of guarantee for your custom ring. Having anything custom made is both nerve wracking and exciting. When I went to the jewelry store to have a loose emerald mounted on a gold setting, the salesman warned me, ” This emerald has a large inclusion which could cause it to crack when we try to mount it. We’ll do our best”. * As for my custom emerald ring, it turned out fine. Since the day I slipped it on my finger 30 years ago at the jewelry store in 1985, it only comes off for a cleaning, then back on again.